Cheers! 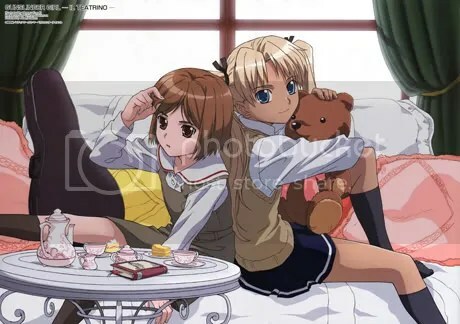 Fan-subbed episode 6 of Gunslinger Girl -Il Teatrino- has finally been released! The series had already ended its current season last month but the team behind this project stopped subbing it after episode 5. Intelligences gathered by my team of highly trained monkeys suggested that the team abandoned this for another series. Now that they have finished their current project, they are now back to subbing Gunslinger Girl -Il Teatrino-. Well better late than never I guess. same sentiments here. much preferred the art style of season 1. much more attention to details and gloomy atmosphere suits the story. season 2 art style looks so colourful and by haruhi what have they done to the girls!? all of them look so moe now! Henrietta blush way too often and rico! what have they done to rico! AhHh. only good thing is that the opening song is very nice. could do with better animation though. I gave up on the show like after 2 episodes. The 2nd season was just too dissapointing. Didnt catch up on Animax though since only seen few episodes, but i like the OP from 1st season ar..^^”..will try look forward on this season. Maybe Triad will drop this series for good, but now they are having fun, trolling people and they have ‘finally released’ kaiji ep 26, and with no words mentioning whether they will drop the series for good or not, i don’t count my hopes high at all, but season 1 is subbed by them as well, and i finally obtained the DVD version – KAA encode, still i hope, triad will complete this series, with only 7 more ep to go…..
yes i hope they will finish it since as u said only 7 more episodes to go. is season 2 really that bad that no other groups wanna take up the project i wonder. ill stick to the infinitely superior manga thank you very much.